The Tiddington Community Centre (TCC) previously known as the Alveston Parish Church Hall is situated behind the wooden fence on Main Street. By 1963 the original Townsend Hall (put into the care of Vicar & Churchwardens in 1928) was in poor repair & found not to be meeting the needs of the various groups who wanted to meet in Tiddington. A successful Stewardship Campaign in 1964 by the Church raised enough money to replace the old wooden building with the current Hall, which has served the community well for over 40 years. 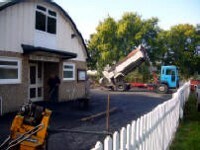 The TCC as a registered charity has the objective of restoring, repairing, maintaining & improving the Tiddington Village Hall to full use as a â€œCommunity Centreâ€ï¿½ under a new 35-year lease from the Church which was signed and became effective on the 4th July 2007. The hall had been closed for 15 months following a fire and substantial repairs and renovation were urgently required before it could be used again. Works are now complete and the full building has been back in use since September 2006. 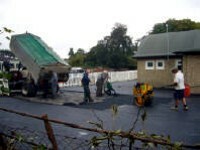 The TCC is run by a 10-person executive who have raised and spent over £130,000 on completing Phase 1, 2, 3 and 4 of the TCC restoration. The hall was totally rewired new heating and lighting installed, the kitchen replaced with commercial cooker and dishwasher, new alarms fitted, all new toilets, adding disabled facilities, re-decorated throughout, the dance floor repaired and re-sanded, flooring replaced in the entrance hall, kitchen, toilets and store room, new double glazed windows installed throughout, new curtains and drapes for the stage with additional stage lighting, new PA system, loop for people with a hearing loss, DVD, speakers, a large screen and projector, new roof fitted, all of the outside area resurfaced removing all overgrown vegetation, trees & bushes, new secure wooden fence added. 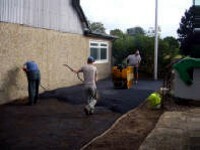 Disabled access to the centre was installed and the outside children’s play area was resurfaced and secured. An outside-inside covered area for use by the many local youngsters who use the TCC is envisaged. 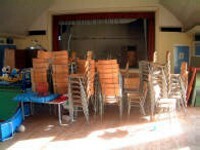 There is also a need for more storage space, thoughts are to extend at the back of the hall. The executive committee ensures that monies continue to be spent on keeping the whole TCC and it’s facilities up to date to ensure this community facility is one that we can all be proud of.